The Drum Machine is a unique audio visual experience which provides up to six users a chance to jam in time together and create an unexpected live improvised electronic composition. 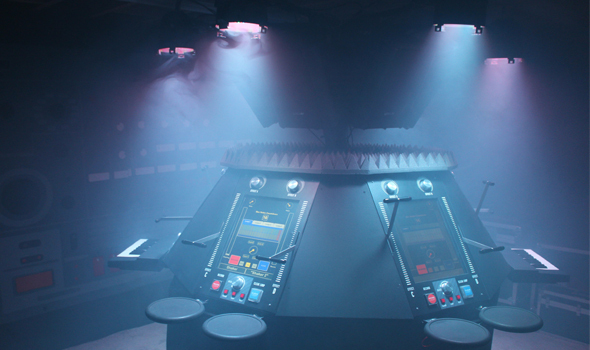 The machine features six hexagonal stations; four which use velocity sensitive drum pads and two using midi keyboards. These are mapped to various sound samples within Ableton Live allowing the users to play out their own rhythms and keyboard parts. The consoles also have an array of knobs, levers and buttons mapped to various effects within Ableton Live which further allow users to alter the dynamics of their creative input. Each console has its own personal audio monitor which enables the user to hear their own sounds, along side this there are individual visual monitors centered on each console. This gives the user a visual cue as to what they are creating and manipulating. Ableton Live is used on a master control station to quantise the incoming rhythms and keyboard parts to enable the sounds to stay locked together in time. An additional beat is provided by a master controller to enable even the worst time keepers to still keep to a solid rhythm. We act as controllers in the booth to add to the overall sound by dropping in and out different basslines and kick drum loops as rewards and also the “voice” of the machine, which encourages the users and further enhances the overall effect, whilst also adding a little offbeat humour as well. The booth operators also control a myriad of different visuals that combine effected images of the users, our own unique style of visuals, plus running messages which both encourage and amuse the users and tie in the music, visuals and voice of the machine to cap off the overall user experience. The idea behind the Drum Machine is to promote the use of music technology in a simple form that allows many more people to ‘play’ and make music they would other wise never have the chance to. It is based around the concept of a futuristic drum circle, where people are encouraged to listen and react to one another’s beats to spur on the creativity of the music being produced. Me and my friends stumbled upon this in shangri-la (glastonbury) a couple of years ago. Ended up staying for hours and missing all the acts we’d planned to see (that’s glastonbury I spose) and having a great time! I don’t consider myself very musical, but between the 6 of us we were churning out music I’d probably pay for! At least I thought so at the time anyway! We now bee-line for the drum machine whenever it turns up at a festival we’re at. Amazing! The Drum Machine was the best thing I saw at Glasto 2011, we were in there for hours on the Thursday night, I’ve never been in such a great bar in all my life, I couldn’t believe it!! My mate said he saw it last year and was great, but was so much improved this year with the monitors and visuals etc and some of the tunes being generated at times we’re nothing short of genius, and created by all the punters at once – simply like nothing else I’ve ever seen – well done the guys in white coats, well done…can’t wait to see it again somewhere, keep up the good work! Thanks Geoff! Glad you and mates enjoyed yourself. We’re constantly making improvements and tweaks to the experience so if you have any suggestions we’d love to know. See you there next time! Looks like a lot of fun, easy to use and probably very addictive!! Would love to have a go on her, also love the design looks like it came from the original hitchhikers guide series! Seeing it in bristol and the festivals beyond, the drum machine never ceases to amase me! When the music all comes together when you least expect it you can feel more like you are in a club than an interactive installation. Every year it gets bigger and better and for one can’t wait to see what they have up their sleaves at this years festivals. Well done Drum Machine! The drum machine is a really cool implementation of an already existing concept. I admire and respect the work that obviously went into it. However, I can’t seem to find any mention of Moldover and his SyncoMasher project (which precedes this one by a couple of years), since it’s so similar. I find it hard to believe it wasn’t a source of inspiration. Hi Vladimir. Thanks for your comment. I can honestly say that we have never seen the OctoMasher or the SyncoMasher but thanks for the links as they both look like fascinating projects! I can totally see why you thought the Drum Machine may have been inspired by it as there are some similarities in their presentation. Our first inpsiration was Glastonbury’s (live) drum circles and the way that humans are able to come together to create an unified rhythm. This formed our reasoning behind the circular formation of the controllers to create an electronic drum circle. We were secondly inspired by Ableton’s flexibility and MAX MSPs ingenuity. And thirdly The Drum Machine was inspired by our Steve’s own creation from 2006. A one-player circuit bent musical arcade machine called The Abletonator. So as I said, I find it really interesting that something similar is out there. But I think the inspiration is a shared one and completely understandable. A shared inspiration to create circuit bent Ableton controllers. And a shared inspiration to bring humans together through the powerful uniting forces of music.